Our farm is located in the Northeast Kingdom of Vermont. A book came in the mail as part of my ongoing interest in methods of dyeing with Indigo. The color blue and the magical process that imparts a short lived yellow, then green and finally blue to cloth or fiber is a surprise each time it occurs. It is both fresh and engaging. But the process has been modified over the years to incorporate modern chemicals for speed and success in making a vat. Traditionally indigo is a dye that has required patience and time. It is unlike other natural dye materials in that it doesn't readily dissolve in water. It must be reduced, a process which removes the oxygen from the dye vat thus making the indigo available to the fiber. Anything less deposits the color on the fiber but not into the fiber. Indigo dyeing and its process is found in most cultures around the world. But recipes vary according to local materials. After many attempts to use the modern recipe of indigo, thiox and lye I finally gave up. Not because it didn't work but because I was getting headaches from the process. The ProChem MSDS (Material Safety Data Sheet), THIOX, identifies a number of hazards in Section 3 and Section 10 including production of toxic carbon monoxide fumes. I mentioned this to a friend and production natural dyer in Maine who did large quantities of indigo dyeing. She set up a carbon monoxide meter to monitor the levels in her dye room at work. While the alert did not sound it still indicated some carbon monoxide was present. So what is natural about using thiox along with lye? Probably not a lot. It is, however, a quick way to get a vat up and running without a wait time. But it occurs to me that slow fiber making is a retreat to the methodical sanity of meditation and mindfulness. Process which is purposeful and unhurried. And so a new quest began and continues. To research and develop some natural fermentation vats. They take longer but how quiet and satisfying it is to dye blue without toxic fumes. And so I will continue to document my journey into the the dark world of blue. Indigo is for me the most magical of dyes. And a fermentation vat is akin to my cheese making and baking with sourdough. There is a thread which ties these practices together in a neat bow fed by biological process and bacteria. 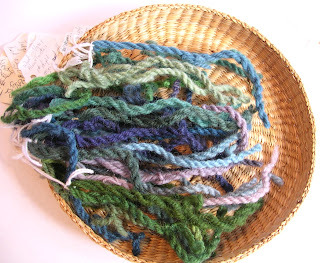 I really enjoyed reading this post and taking your natural dyes workshop on Friday in Rhinebeck. I, too, find indigo magical, and I'm especially interested in the tradition of the organic vat and how it coaxed color from this reluctant plant. I'll look forward to reading more as your explorations continue. Welcome to the Brigid's Farm Blog. Our farm is located in the Northeast Kingdom of Vermont. I'm a fiber artist and farmer who raises and works with my own wool and mohair. I raise Border Leicester cross sheep and natural colored angora (mohair) goats. Visit us for updates on the activities here at the farm. The studio at the farm has great views overlooking the brook in 2 directions and up into our woods. Currently 5 looms and a collection of spinning wheels take up space in there. The studio is used primarily as my workshop and for classes that are taught here. Our specialty is natural dyeing. I often use natural dye extracts for both immersion dyeing and surface design techniques. In addition to dyeing, the studio has operated as a production weaving studio since 1979. Brigid's Farm Blog is set to take comments from anyone. Comments are moderated but anything on topic will be posted. Your comments will be published whether you have a password or not. It is your choice whether to identify yourself in some way. You have the option to post as Anonymous. I welcome comments and please feel free to link to the Blog. Contact Brigid's Farm for information and pricing on Earthues Natural Dye Extracts. We also carry Schacht Looms and Spinning Wheels, Lendrum Spinning Wheels, KA and Inox Knitting Needles, books, fiber, hand-dyed yarn and lots of ethnic buttons. Classes are happening in the studio and I am available to teach classes and for private one on one work.